I've had horses my whole life, and I've had them get thrush before, but never anything like this. However, weeks of daily rains, wet grass, and muddy corners of pasture have done a number on Zip's hooves. I got him out to lunge him recently and noticed he was slightly lame. Two days later, slightly lame again. I looked him over well and the only thing I could find was a slight crack in the heel of his hoof. So a few days later, when the vet was out to administer rabies shots, I asked if that could be the cause of his lameness. He said, "Hmmm, could be. Looks like thrush. Let me trim this up with a hoof knife and take a better look." He trimmed it, which made the crack more visible, and then lo and behold stuck his finger in the crack about an inch and a half deep! Shudder! The vet said, "Yup, that's definitely the problem!" So what did the vet give me for Zip? A treatment for cows, of course. 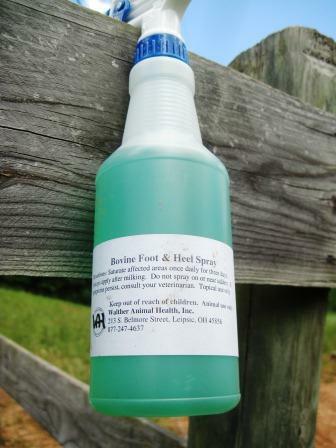 He said this Bovine Foot and Heel Spray worked better than any of the horse treatments. For $38 I should hope so. It's a gel, so it sticks in place. Zip doesn't like it - I think it must sting a little. Sadly, the rain has kept him from healing very much, but I'm hoping his thrush will dry out soon so he can feel better and I can get out riding! It's Rural Thursday, so now is your chance to jump in with your own animal stories (hopefully not as gross as mine), recipes, crafts, walks in the woods, or anything else that fits in with a rural mindset. You can link up at A Rural Journal or right here! Just grab the code for the button and add it to your post. Then come link up your url and be sure to visit and comment on at least 5 other posts! Looking forward to reading and looking at your pictures this week! Tough weather, we have had the opposite for a bit. We hope ZIP's hooves gets to feeling better soon. When we had horses and donkeys- the rain caused rot and thrush too. Sometimes we felt like it was never ending. I hope your spray works well. Oh my goodness, I guess I know nothing about thrush. I know what it looks like when humans get it in their mouth. But I never thought it had big cuts like this! It looks like he was cut with a knife, and must be really painful. Hello...I've had horses before, and I understand how important it is to keep the hooves healthy. I found a website called "HealthyHoof.com that you might find interesting. There is a section on thrush. Good luck with your horse! Poor Zip. I hope he starts feeling better soon. I've dealt with thrush before and it's no fun, especially for the horses. I hope Zip heals quickly! I'm so sorry about Zip, Lisa -- I always hate seeing animals suffer like this. I hope your weather dries up enough for him to heal. Ouch! While a bit of rain is good, I hope it dries up enough so his hooves can dry out and heal. You'll have to tell us how the bovine thrush treatment works and if it IS better than the standard equine stuff! Hopefully it'll sting less as the thrush clears up. Poor Zip! That must be so painful. I do hope the new bovine treatment does the trick! That looks painful! Poor Zip. Hopefully you will be out riding again soon. Awwww... poor thing. I can talk for hours about thrush. I wonder if grapefruit seed extract would work? oh poor zip!! hope he's feeling zippy again soon!! Hope he gets better soon! We'll take some of that rain here if you don't want it! We've had lots of rain too, but the dry and HEAT is coming now... May even get up to 90 degrees this weekend. Yuk!! Poor Zip! I always dread seeing something like that. I hope your spray works well. 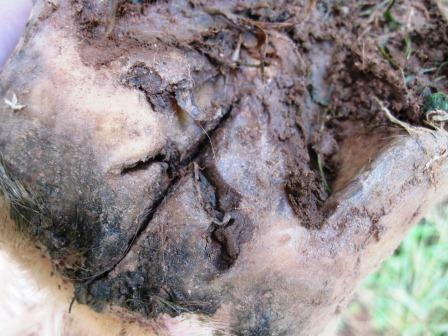 Not fun dealing with hoof issues. I am with you ....wish it would dry out a bit. At least for a few days. i can honestly say, i've never had any of my horses with thrush here in texas. now, foundering and colic, yes. Yowch! That sounds painful! I just love horses. I actually used to have a horse named Zip! He was a Paint / Quarter Horse. Loved him to death. I still want to get another horse down the road, somebody, when we have the property. awww lisa, poor zip, that looks painful. i hope the spay helps, thank goodness for people in the know!! I want this to be fully effective remedy and get cured. Rarely do we see thrush in Arizona, but when I have we usually just soak in bleach water a couple times a day and it will clear up. Although, his sounds pretty bad. Hope Zip heals well and soon. I'm terrified of horses. Grew up with them but they were always so big and so powerful, I just know they were going to trample me. My favorite way to be around horses is on the other side of the fence. There are few things as beautiful as a horse racing through the fields. Wow, that sounds painful for Zip. Good to know what Thrush is for a horse (since we're pretty new at this horse ownership thing). I hope he gets to feeling better soon. Ouch! Poor Zip. Hope he is better soon with the new treatment. Oh wow, Lisa. I hope Zip's thrush is cured soon. Poor thing. Oohh, that smarts. We've had a lot of trouble with our oldest mare- weight issues. Finally tried rice bran which seemed to do the trick, but she worries me crazy sometimes. Hope the rain stops soon! That looks painful for him and you too. I hope he gets well very soon. I so love his name...and I pray he's back to 100% very soon. Poor guy! So very sorry about Zip and I hope the gel will work soon. Wishing you and your family a nice and safe weekend. I didn't even know you had a horse. My bad. Good to know about this stuff. Hopefully you won't need it again. Do the boys ride? Hope the gel works quickly and has Zip feeling better soon. It's so hard when our animals are sick or ailing. Sorry Zip is a little down. Hope the rains slack off and the gel works soon. Bet Zip would rather the both of you could be enjoying some riding and running with the wind. Your poor horse. That hoof looks horrible and I hope it heals soon! I hope Zip gets better soon! That really didn't look good at all. Poor Zip! I hope he's feeling better. Surprisingly, my horse has never had thrush!